Well... besides entrance, hay rides and corn maze entrances? Did you know there are 41 varieties of pumpkins? Shadow Creek LOVES pumpkins, and our Pumpkin Shack is the perfect place to show them off! You will find pumpkins all over our farm, but when you're ready to purchase...this is where you come! From tiny to huge, we have everything you're looking for. A Jack to carve or decorative pumpkins for your front porch or table, you'll find plenty to love in the shack! Our Gigantic Jump Pad is the first of its kind in the United States, and you'll have to see it to believe it! 2100 square feet for kids to jump into fall...how can you go wrong?!? We have LIVE Music at the farm every Saturday and Sunday, and a new Band Barn to house our musicians! Sit on a haybale, lean against a tree, eat your street tacos at a picnic table and enjoy the sights and sounds of the farm! New for Fall 2018, local Midlothian High School FFA Members will be manning our children's Barnyard area and teaching our customers about our farm animals, including pygmy goats, pigs, alpacas, chickens and chicks! Who doesn't love a good, long slide down the bank of the pond? Add hay, burlap bags and lots of laugh and you'll be right at home on our hay hill slide! New for Fall 2018, we've got even MORE SLIDES to choose from! Take a ride on the farm side and ride around an encircled hay area! 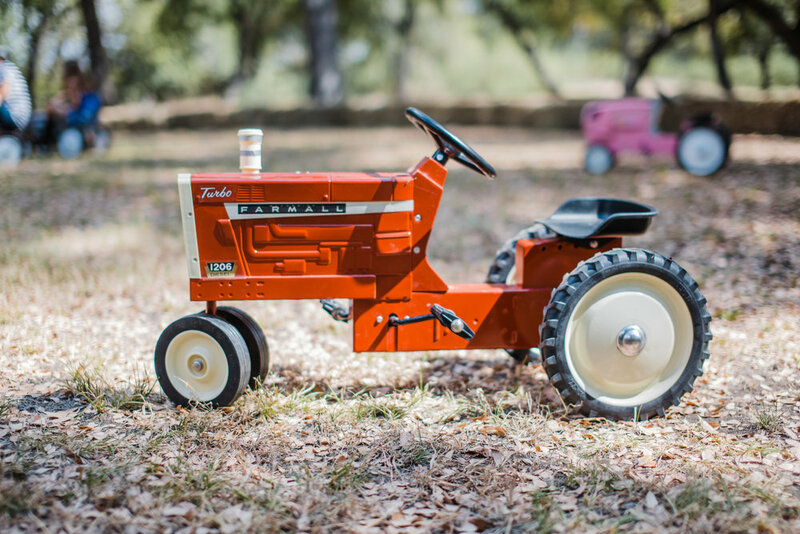 Children 5 and under are welcome to climb aboard these small tractors and pedal to their hearts content! Thanks to the Murray Family in Mt Peak, we have some of the most amazing vintage farm equipment pieces around. More than 10 tractors, road graders and other unique farm pieces are scattered around the park for you to climb on, learn about and enjoy. There are too many casual photo opportunities to count! Snap pics of your babies in the pumpkin patch, aboard a tractor, beside the cedar rail fence and on bales of hay. Everywhere you turn, there's a chance for a new memory to be made! If you'd like a professional photgrapher to take your pics, MEDIA PASSES are available on and off season, and we will offer a professional photography option as well! The only thing that makes this game any better is when you use different colored pumpkins to out-wit your competition. Relax on hay bales and make your move in our gaming area! If you think a game of chicken foot gets lively at the small, round dining room table...try playing a round at Shadow Creek with our lawn-sized domino set! Spread out as you take over the game in our gaming area! Everybody watch out! You never know when the tower will tumble! Another large version of a classic game, this one is sure to be on-the-build, all the time! Can you toss with the best of them? We have several games for you to try and dominate the field! Can you say dice? Six of them..and they're huge! Farkle, yahtzee and other games are even more fun with these over-sized squares! Who doesn't love baby chickens? We'll ahem chicks here for you to love and feed during your visit. Be watching the curriculum calendar for lessons on chickens as well to make your visit even more meaningful! Enjoy the crisp fall air in the country, while making memories with the whole family.